Display is 12 digits, separate amber discharge tubes. Main semiconductors - LSI (Large Scale Integration) Sanyo D231B and D232B, here date coded late 1971 and early 1972. 218 x 254 x 80 mm (8.6" x 10" x 3.2"). 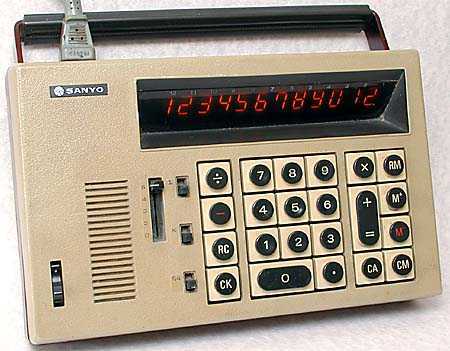 Sanyo produced a number of distinctive early calculators. The styling of this model is very similar to a portable transistor radio of the period, even down to the cooling louvres which resemble the speaker grille of a radio. The carrying handle can be pushed flushed with the casing or can be folded under the back to tilt the calculator forward at a more ergonomic angle. See also the Sanyo ICC-809 for a similar, hand-held model. 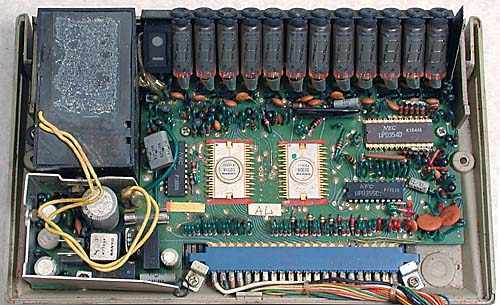 The circuit board of the Sanyo ICC-1122 with the 12 amber discharge tubes along the top. The two Sanyo LSI (Large Scale Integration) chips are the white, ceramic components in the centre.